My Survival As An Aboriginal rocked Australia and the world with its presentation of atrocities and hardships committed against Aboriginal people. The movie delves beneath surface appearances to reveal a strong resistance to assimilation and loss of identity, as the late Essie Coffey, a Murrawarri woman, takes us into the Aboriginal struggle for survival. She documents the effect of dispossession, the chronic depression, alcoholism, deaths in custody and poverty that were so much a part of life for Aboriginal people. Essie, also affectionately known as the Bush Queen, was a singer and activist from the far northwest of New South Wales. This film will have interest and relevance for teachers and students at secondary and tertiary levels. Curriculum links include: Indigenous Studies, Australian History, SOSE, Legal Studies, Media Studies and English. Looks in particular at the lives of the Murruwarri people of northwestern New South Wales. 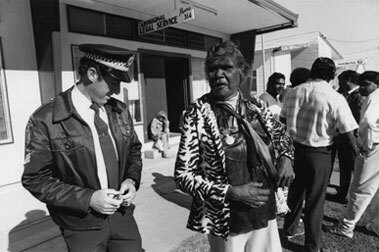 Essie Coffey with police outside an Aboriginal Legal Office. Police and courts have always been, and are still, part of many Aboriginal people's lives. Thanks to Martha Ansara for pointing me to this film and providing details and photos. My Survival As An Aboriginal was the first documentary directed by an Indigenous woman and one of the first films where Indigenous people had a determining role in how they and their community were represented. My Survival As An Aboriginal was filmed in Brewarrina, New South Wales, about 830kms north-west of Sydney. Released on video in Australia as part of the Picturing Black Australia series. Essie Coffey gave a copy of My Survival As An Aboriginal as a gift to Queen Elizabeth II at the opening of Australia's new Parliament House in 1988. Coffey also appeared in Phillip Noyce's film Backroads. Essie Coffey died on January 6, 1998, aged 56.